मुझे बनना है UPSC टॉपर Book - निशान्त जैन - रैंक 13 - हिंदी माध्यम के IAS टॉपर. We express gratitude to Nishant Jain Ji that he tried to reach the UPSC candidates by the information of his Motivational Book through several websites. In the last year, after getting the 13th rank in Civil Services Examination, the 2015 batch trainee IAS, getting the highest position in Hindi medium. 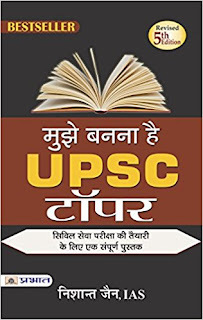 Official Manthan Jain's first book, Mujhe Banna Hai UPSC Topper ' is now available online and in the market. In this book published by Prabhat Publications, New Delhi, Mr. Jain has highlighted all the important aspects related to the preparation of IAS and PCS examinations. Through a total of 18 chapters, he has discussed the strategy of pre-men's, interviewed trio, essay, writing skills, personality development, motivation level, study material, etc. in the simplest language, through all the new chapters. At the end of the book, the struggling and untold stories of successful young people succeeded in the Civil Services Examination in recent years have also been included. The price of "Mujhe Banna Hai UPSC Topper" is only Rs 195 of the 272-page book. Read, Do not Read, How to Read? Nishant Jain, who achieved 13th rank in the Civil Services Examination of UPSC 2014, is the topper of Hindi / Indian languages. Anant, who obtained the third highest point of the examination (851 points) in the main examination, has received 160 marks in essay paper and optional subject- 313 points in Hindi literature, which is probably the highest number. In the small background of Uttar Pradesh's small town, Meerut, in the initial examination of the UPSC's Civil Services Examination, in 2013, it was not passed in the initial examination. After post-graduation in History, Political Science and Graduation in English and Hindi Literature, UGC's Net-JRF Passed. In the days of college, Mukt, who was fond of debate, poetry, and anchoring, M.Phil from Delhi University And the Official Language Division of Lok Sabha Secretariat also worked for two years. Nishant Jain interested in writing poems and communicating with youth; There is a deep trend in language-literature-culture, creative writing, education, social work, Public Administration optional Subject. The 2015 batch IAS Trainee Officer. If you are also preparing for the examination of the UPSC and you want you to get a book that gives you good guidance then you are in the right place. Friends, many students dream that they also became Topper in the UPSC exams and also got a good civil service job. But many times they do not get good guidance because they cannot fulfill this dream. For friends such students, we have brought a very good PDF of the book today. The name of which is: Mujhe Banna Hai UPSC Topper Book- Nishant Jain Download. This book is written by IAS topper Nishant Jain. And he has topped through Hindi medium in IS. So I think you must read this book once. All of you can download PDF by download button below. In this book, we have made a list of what you will read and learn. These lists will prove useful to all of you. This book is specially written keeping in mind the students preparing for the UPSC. This book is also very helpful as it is written by an IAS topper, then it is obvious that all the questions that have been made to the author of the problem book are addressed in this book. The size of this book is 59 MB and this book has total 213 pages and this direct download link of this book has been made available here, which you can download very easily and save in your computer or mobile. The candidates are very well informed about how to prepare for the preparation of IAS in this book, and after reading, you will get a lot of inspiration and if you want to become topper then it is my advice to all of you All of you must read this book once. Is it possible to do a job with the preparation of CIVIL SERVICES EXAM (IAS Exam)?